This impressive tunnel carries Billingham Beck under what was originally the Clarence Railway. Not sure if this is the original 1830s construction or the bricks are later, there also seems to be a reinforcement or repair a short distance in on concrete. This tunnel carried the mill race for Norton Water Mill underneath the Clarence Railway embankment that was built in the early 1830s. The modern railway still passes above. The mill itself stood about 500m South, now underneath the A19. Despite its theatre/cinema looks this building was built as a department store for the Stockton Co-operative Society. 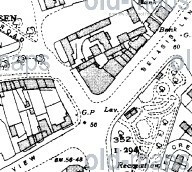 The building outline appears in its current form between the 1938 and 1939 editions of the OS map, although it could date from slightly earlier if the 1938 was already out of date. I’ve found a reference to the nearby Heslops Brewey being sold to the Billingham Picture House Company in 1936 and demolished shortly afterwards, so suspect this whole area dates from around that time. Externally the building is pretty much unchanged since this 1935 photo. The building was recently an Indian restaurant but is currently being redeveloped by Fracture Theatre who also hope to show films there again. Billingham Hall was a Victorian Villa built around 1870 and demolished in 1935. The Hall itself is now under Connifer Crescent, but the gates and lodge reamain. Dove Sculpture by Andrew McKeown in the Peace Garden near the war memorials. Theres an additional small plaque on one wall for a single casualty of the Korean war, Sgt R Liddle. Nearby is a new memorial for casulties since 1945 that was erected by Royal Electrical and Mechanical Engineers Association around 2009. Most unusual is a plaque erected by the British Nuclear Test Veterans Association for those who died as a result of the tests at Monte Bello, Emufield, Maralinga, Malden Island and Christmas Island.